Over the past year I have read rumors regarding a possible manuscript for the next book in Larsson's Millenium Series. This morning a close friend of Larsson revealed details of the manuscript to the press. 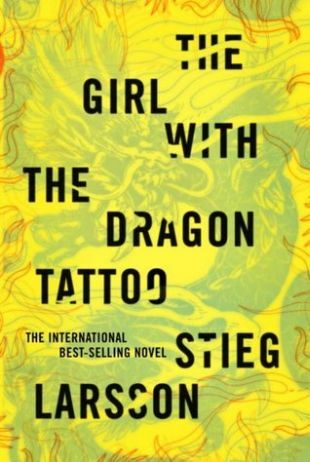 Larsson confidant Kurdo Baksi told Swedish daily paper the Expressen that Camilla, the estranged twin sister of Millennium’s goth hacker heroine Lisbeth Salander, plays a major role in the fourth book. Lisbeth's sister was the one unfinished piece of the Millenium Trilogy that I really, really wanted. I can't imagine I'm alone in this. Larsson's girlfriend and his family have been in a constant battle over his estate. The fate of this fourth book is dependent on their resolution since both sides claim ownership to the manuscript. 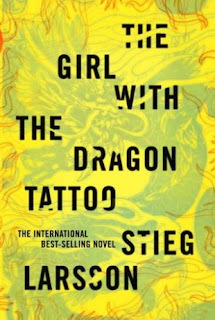 I'm keeping my fingers crossed that we will get to experience one more Larsson book after all. Have you read the Larsson books? Are you eager to read the next book? 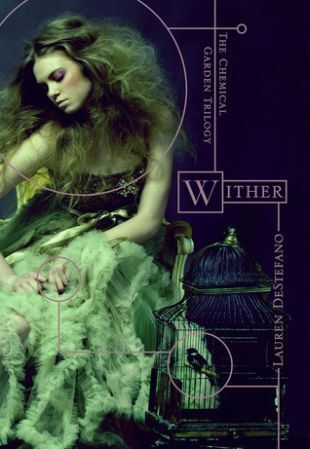 Wither is the first book in the new Chemical Garden series and the debut novel of Lauren DeStefano. 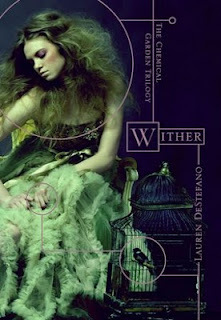 Wither is the story of Rhine - a 16 year old girl who will assumably die at age 20. There is a virus/genetic defect that kills females at 20 and males at 25. Rhine is kidnapped and forced to marry a wealthy 21 year old - who is also 4 years away from death. Despite the consequences, Rhine is determined to escape her new life and return home to her twin brother. First and foremost, I enjoyed reading this book. 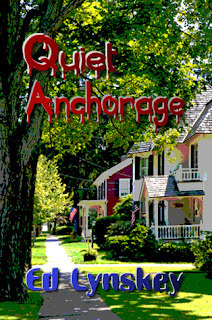 I found it well written, fast paced, and atmospheric. I would recommend this to anyone who enjoys the young adult dystopian genre. I did, however, have a hard time suspending my disbelief. I was left with many questions regarding the society, the characters, and the motivation behind the events taking place. I think these questions would make for excellent book club discussions, but they also make it necessary for the reader to enter DeStefano's dystopia with an open mind and a willingness to let go of logic a little. Are you a fan of dystopia? I love it. I'm not a huge fan of the trending series format - I prefer a resolved story, but I'm happy with all of the darker subject matter being published lately. 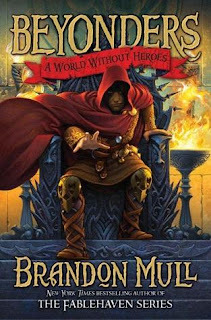 A World without Heroes is the first book in a new middle grade series by Brandon Mull. Jason Walker has often wished his life could be a bit less predictable--until a routine day at the zoo ends with Jason suddenly transporting from the hippo tank to a place unlike anything he's ever seen. In the past, the people of Lyrian welcomed visitors from the Beyond, but attitudes have changed since the wizard emperor Maldor rose to power. The brave resistors who opposed the emperor have been bought off or broken, leaving a realm where fear and suspicion prevail. Brandon Mull must be a naturally funny guy. I laughed out loud several times while reading this book. There is more humor in the first half, but the subject matter grows more serious as the story progresses. A World Without Heroes follows Jason - a typical 13 year old boy - as he enters a new world and inadvertently accepts a dangerous quest. In his quest he discovers he's not the only one who mysteriously entered the world of Lyrian that day. He is joined by Rachel, and together they must work to defeat the evil emperor and become heroes to a world that knows none. A World Without Heroes is a fun adventure full of danger and suspense. The world of Lyrian is easy for the reader to enter and join in the quest. As a stand alone book, there is not enough resolution to be satisfied with the ending. As the beginning of a series, however, it has successfully made me want to carry on with the rest of the series. I recommend this series to fantasy fans who love a heroic quest. Have you read anything by Brandon Mull? This was my first book by him. He has also written the young adult series Fablehaven. I'm choosing to review all three books of the His Dark Materials series in one post instead of reviewing them separately. 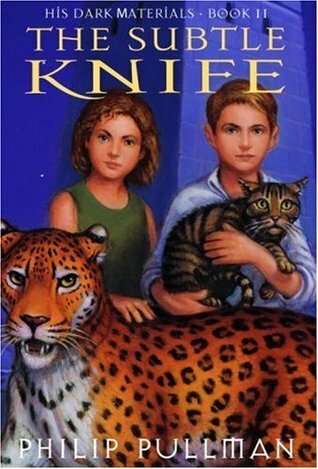 The first book of the series was the hardest read for me. I'm not an avid fantasy reader, and sometimes it's hard for me to fully enter a world and "see" things properly while I read. Even though I struggled through this one a bit, I never lost interest. By the end I was fully invested in the characters - Lyra! - and ready to immediately pick up book 2. The second book of the series was set in a world much like our own. This was a much easier read for me. 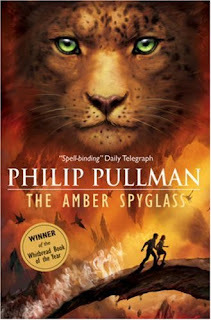 I was so hooked and loved the new characters Pullman introduced - Will and Mary Malone. 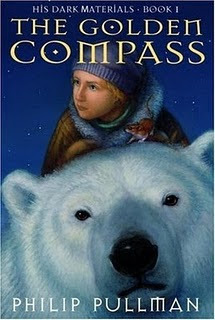 The third book contained a world completely different than ours, but one I had absolutely no trouble losing myself in. In fact, I didn't want to leave. As stand alone books, these are good reads. As a series, however, they become something great. I ended the series with that ultimate feeling of having lost a friend. I don't experience that often so I am quite fond of this series. If you want to be captivated by something new, I highly recommend you check it out! Have you read any of the His Dark Material books? I love when I can lose myself in a new world and make new friends through a book! 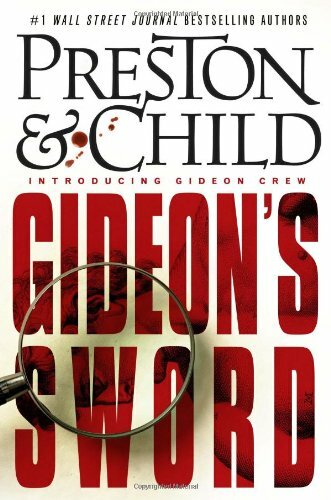 Gideon's Sword is the first book in a new series by Douglas Preston and Lincoln Child. I'm a fan of Preston and Child. For years I have enjoyed their Pendergast series with Relic being one of my favorite all time reads. I was excited to have the chance to read the debut of their new Gideon Crew series - Gideon's Sword. I was hooked from page 2. Gideon's Sword had a fantastic start with the story of Gideon's father. Unfortunately the exciting first chapter turned out to be background information. While the rest of Gideon's Sword did not disappoint, I was left longing for the full story of his father Melvin Crew. Thankfully, Gideon has his own story to tell. I do have some unanswered questions - several things seemed too easy for Crew to pull off - but I'm hoping we will learn more about Crew and his past as the series moves forward. 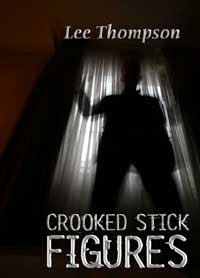 Gideon's Sword is fast paced and full of action. 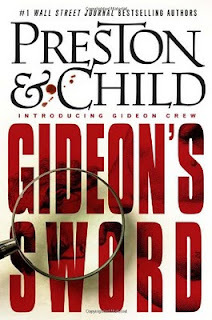 If you haven't read Preston and Child yet, I highly recommend you check them out by either starting this Gideon Crew series or starting on their Pendergast series. Either way, I think you'll come back around to this one. Are you a Preston/Child fan? I have a few Pendergast books I still need to catch up on. I've loved every one that I've read.